Witch Hazels are in flower right now and the scented, acid yellow flowers certainly brighten up a dark February day. What plant in their right mind chooses to flower now? 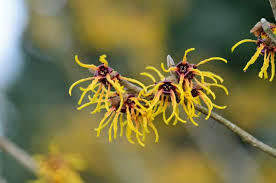 Well the Witch Hazel (Hamamellis mollis) defies logic and goes ahead anyway – for our pleasure! Next PostNext Has Spring Sprung?